Our carpet stain remover for dry stains consistently gets unsolicited fan mail from customers delighted with how it has performed. It's NOW available for purchase online at Ecomist as part of a triple pack with our wet stain remover. It can also be found at Woolworths and IGA supermarkets in the cleaning aisle. 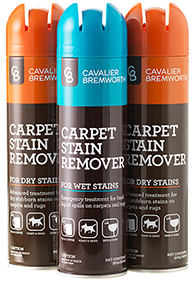 70% of all carpet stains are wet so we developed an emergency wet stain remover that acts instantly to treat wet stains on all carpets and rugs. This product is only available for purchase online through Ecomist as part of a triple pack with two of our dry stain remover cans.